A while back, a business trip took me to Memphis for the first time. Me and my boss at the time, let’s call her Daphne, were just there for a morning presentation, but I made sure to book a late flight home in order to have time to visit Graceland – something I had always wanted to do. Our host’s secretary had booked the tour for us, and told us to check in with the concierge at noon. But the concierge knew nothing about it, and had to phone somebody. Several times, in fact. We could hear his mumbling, shoo-fly end of the conversation, which made it clear that whoever he was talking to, each of his calls was coming as a complete surprise. I could tell that the delay and the mumbling were starting to get to Daphne. She was from up North and had become accustomed to a Manhattan level of efficiency. This was nowhere in sight. We had a long wait before a small, very beat-up bus pulled up. 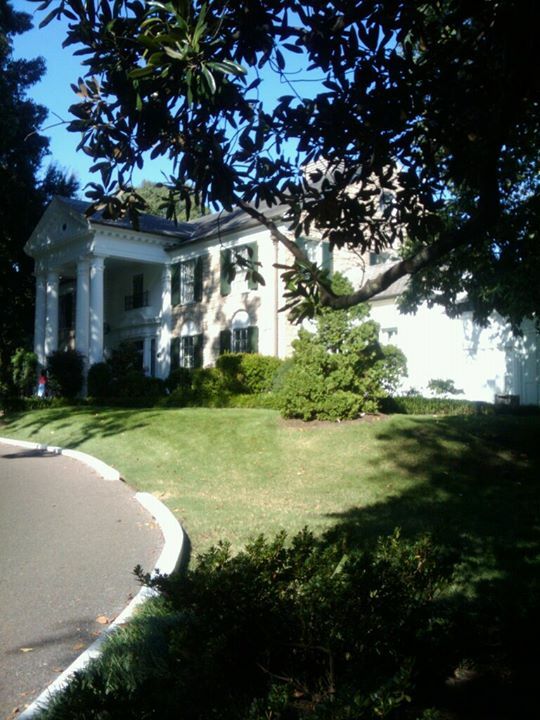 Michelle, the driver, was giving a tour of the city but offered to drop us off at Graceland, no problem. So we began a rambling ride around Memphis, with Michelle keeping up her tour guide spiel the whole way. I didn’t think it was possible to shout and mumble at the same time, but she’d mastered this difficult art. The relaxed, anything-goes Southern vibe was cool with me, but I could feel Daphne growing steadily more irritated. 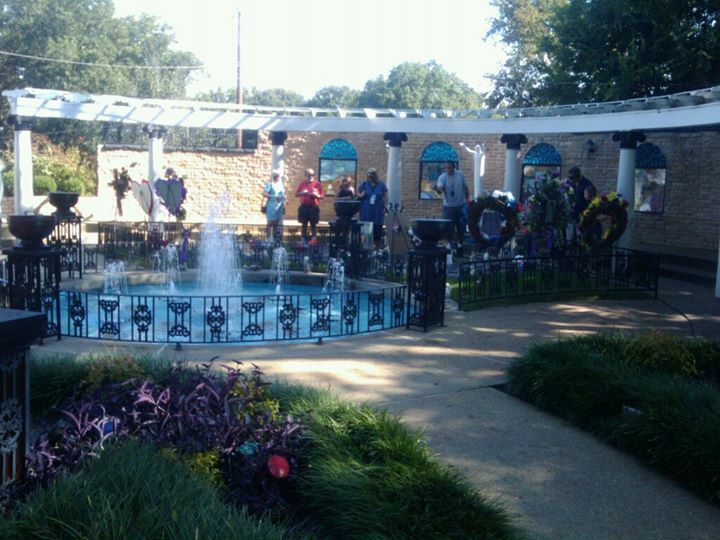 We finally pulled up to Graceland Plaza, which is across Elvis Presley Boulevard from the mansion. 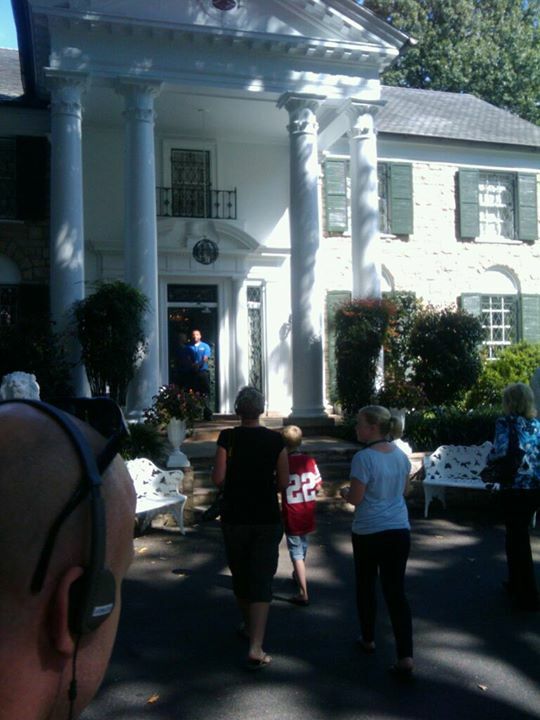 There was quite a lot of confusion about our luggage, and how to pay for the ride, and the tour… Graceland has 1,500 visitors a day, but you could easily get the impression that nobody had ever done it before, that the city of Memphis had just gotten the idea the previous week. Daphne, not an Elvis fan to begin with and now in a really foul mood, actually got on her cell phone to find an earlier flight home. No dice. We were stuck. Or rather, she was stuck, because I had no intention of getting an earlier flight home. I hadn’t come all this way only to get across the street and bail. Another little bus came, and I coaxed her onto it the way you would a recalcitrant five-year-old, and it finally trundled us and a German family through the famous music-themed gates, and up the hill to the house. From the outside, it’s smaller than you expect. 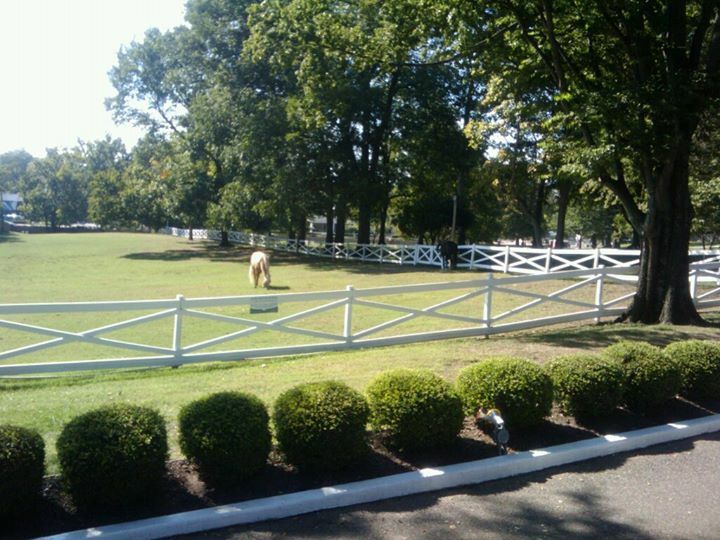 Built in 1939, it’s in the Colonial revival style popular at the time, thanks to “Gone with the Wind.” It sits atop a beautiful piece of land, with horse paddocks in front and behind. Inside, everything has been frozen in time, as if it’s still 1975. The front room could be my parents’ old living room, except for the big stained glass windows with the inlaid peacocks. Same with the formal dining room and the kitchen, all dark paneling and ancient appliances. The look is traditional and upper middle class… not very ostentatious for a man who earned something like $20 million a year (in 60s money) for 25 years. Farther into the house, it’s a different story. The downstairs rec room, the famous jungle-themed den, the racquetball building, and other spaces are what you’d expect a wealthy 20-something rockstar to build for himself. Lots of custom-made bars (there were at least four of them, and Elvis didn’t drink), crazy fabrics and textures on the walls, some upholstered ceilings. Late-period Elvis in all his karate-chopping jumpsuited glory might lead you to think that Graceland is tacky, but it’s not. It reflects its owner completely, being a perfectly blended mixture of Southern graciousness, redneck excess, musician cool, and the indefinable air of authority that comes from huge success. A hint of that success is represented by two separate buildings that house Elvis’ trophies and awards—including an 80-foot-long hallway covered in gold records—163 of them, representing more than 800 million records sold. It’s overwhelming. Outside, by a small swimming pool, there’s a family gravesite. 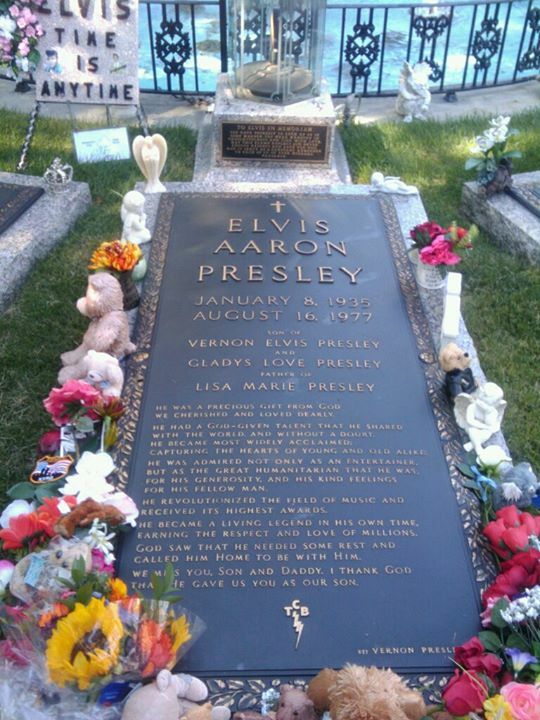 After Elvis died, he was buried in a public cemetery next to his mother. Within days, someone had tried to dig up his corpse, so his father Vernon had Elvis and his mother’s remains moved to the house. Now Vernon is there too, with a couple of other family members and a marker for Elvis’ stillborn twin brother, who was buried in an unmarked pauper’s grave in 1935 and couldn’t be found. This whisper of sadness and loss and mystery is central to Elvis Presley, maybe part of his self-destruction; certainly it’s part of what draws you to him and makes you feel such empathy. He’s not some remote Rock God, he’s one of us; his house is like your granddaddy’s house, only exponentially more awesome. He’s still there in the house and on the grounds, a palpable presence—you can feel his wildness and excess, even though much of it has been carefully airbrushed away by the guardians of his estate, and especially you can feel his modesty, his gentleness, his sense of fun, his essential goodness. He’s your friend. And like a friend who’s gone, it feels like he’s just in the other room, coming back any minute. By the time we boarded the bus back to the Plaza and found a cab to the airport, Daphne was in a relaxed, upbeat mood. Something had happened to her. Or, to be more exact, some one had happened to her. We bought some T-shirts, postcards, and trinkets at one of the gift shops, and headed home.